Awaiting those two thieves – as well as the other lead characters soon to come – is an ancient tribe of cannibalistic, Troglodyte cave-dwellers, remnants of an America long-since forgotten and a clan of beings to which the Native American people don't even give a name. These brutal savages track the sole surviving thief to the nearby town of Bright Hope. The small township is home to our small cluster of protagonists: Sheriff Franklin Hunt (played by Kurt Russell); his aged deputy, Chicory (played by Richard Jenkins); local resident and self-described Indian killer, John Brooder (played by Matthew Fox); and a cattle driver stuck at home with a busted leg, Arthur O'Dwyer (played by Patrick Wilson). It becomes the task of these four men to track the cannibals back to the cave in which they dwell, as they have taken O'Dwyer's wife, Samantha (played by Lili Simmons), and Hunt's younger deputy (played by Evan Jonigkeit) hostage. The posse's journey is long, and the men must learn to cope with one another as well as the dangers that lurk about in the hostile country. It's a violent, violent country in case you couldn't already tell. Bone Tomahawk is right up the alley of anyone who loves Westerns and horror films alike. Director Zahler's choice in actors to play those two thieves at the beginning – David Arquette and Sid Haig – seems almost an inside joke for fans of this particular sub-genre, Arquette having previously appeared in the much beloved Ravenous and Haig being a staple of 1970's, Grindhouse fare including Spaghetti Westerns. Bone Tomahawk seems predestined for cult classic status, but even that might be undervaluing how good it is. Zahler takes his time in telling the story of the task these four men undertake. He allows his characters to develop, no scenes rushed through or glossed over. The bulk of the mid-section is made up of the horseback journey through the untouched land, and the filmmaker keeps it airy with cute but clever dialogue spoken by some fine, acting talent. You grow attached to these four men, the film never cutting to the cave-dwellers or the horrors befalling their hostages. The terror that fills much of the film is in the anticipation for what will transpire once the four men reach the cave, and, then, horror certainly fills the screen. Bone Tomahawk marks Zahler's debut as feature film director, and, to his credit, the marks of an amateur are easily hidden here. Some of the frame seems clunky, much of the camerawork aided by cinematographer Benji Bakshi set up for simple coverage. It's in what Zahler & Bakshi are shooting, though, that captivates the viewer's eye. The beautiful, American landscape that passes by pushes the epic quality of the film. It does more so than the 133-minute running time, which passes by surprisingly well. Zahler's pacing of action and the alluring quality of the film's four lead actors certainly has a hand in that. It seems almost a foregone conclusion that Russell, Jenkins, Wilson & Fox are all going to give accomplished performances, but Zahler doesn't seem satisfied with that. 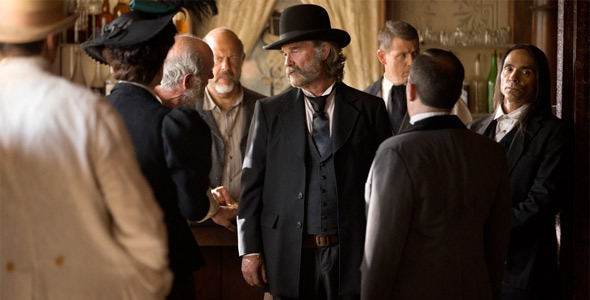 It's mostly noticed with Russell's Sheriff Hunt and Jenkins as his deputy, but the performances in Bone Tomahawk are what truly make the film transcend over other genre titles. Russell, seemingly sporting the same mustache he wears in Tarantino's upcoming The Hateful Eight, is grim and gruff as he's ever been. His charismatic charm bleeds through the smallest bit. I mean, come on, it's Kurt Russell, the man with the most genuine smile in Hollywood. It's a smile that never shows itself in Bone Tomahawk, but that isn't keeping the performance from being genuine. Jenkins, on the other hand, plays comic relief here. It's a subtle bit of levity, the kind only drawn from the cuteness of elderly people trying to be not quite so elderly, but Jenkins gives the entire performance with a natural, naïve-but-determined breeze. Every line he delivers is a gift. The American Western seemed to be dying out recent years, with each year passing by with only one or two entries into the genre. The Western horror sub-genre seems downright sparse. S. Craig Zahler delivers a whopping epic with plenty of brutal genre elements to keep horror fans happy. Bone Tomahawk is a cult-classic type of film that completely delivers on its promise, and, in the post-Tarantino/Rodriguez Grindhouse age, that's one of the rarest gems of all. Bone Tomahawk is certainly a rare gem. YES! Kurt Russell is GOD. By the picture above I thought this was about "Hateful 8"....I'm glad for this Kurt Russell resurgence. He's still got it! Agreed with all comments below, anything Kurt Russel is automatic "must watch"